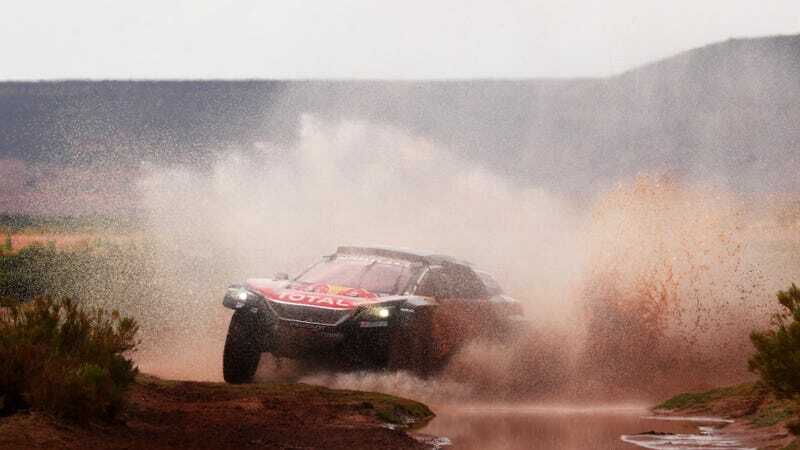 After an alleged wreck between Dakar Rally competitors Carlos Sainz and Kees Koolen, who can’t even agree on whether it happened in the first place, Koolen is threatening legal action. Koolen told Autosport it “would have been a lot easier” for Sainz if Koolen had died, because then he wouldn’t be able to talk. Huh? What? How did this escalate so quickly? Sainz denied hitting any quadbikes during Saturday’s fourth stage and Peugeot indicated they would appeal. Dakar rules say competitors who see an incident have to stop, help those involved and alert rally organizers about it, according to Autosport. Race stewards handed Sainz a penalty for the situation. There are a lot of problems surrounding all of this madness, with the first being that Reuters reports Sainz and the head of his Peugeot race team deny that the wreck ever happened. Sainz said he didn’t hit Koolen or anyone else racing in the small, four-wheeled quad class on the day of this alleged wreck, but Koolen is adamant that Sainz hit him and was unsatisfied with the 10-minute penalty. He believes he is lucky to have survived the incident. “I was doing maybe 20km/h, the Peugeot was doing top speed, maybe 120/150/180,” said Koolen, the reigning quad cross-country rally world champion. “My origin is that I’m an mechanical engineer. The part that was hit and deformed, I will ask a 3D engineer to calculate it, but I think you need 1500 kilos to deform something, maybe 2000 kilos. “I have the parts saved. I expected somebody to steal it so I can’t prove it anymore, but I have saved them and will give it to a calculating company, they will see what the force was. “If the car hit me 20 centimetres to the left, I would be dead. Oh, my. Alright, then. Sainz, who said he knows for sure he didn’t hit any quads, told Autosport that he “miraculously avoided” Koolen, and didn’t touch him. So, Koolen said there was a wreck, Sainz said there wasn’t. Koolen said there was damage, Sainz said there wasn’t. Now, Koolen wants to take legal action for a wreck in which reports don’t mention any injury, in a race that provides more than $5,500 in medical insurance for competitors at current exchange rates. Both Sainz and Koolen are still in the rally, with Sainz ranked fourth in the car class and Koolen fifth in quads at the time of publishing. Update, Jan. 17 at 4:25 p.m. Motorsport.com reports that race stewards took Sainz’s 10-minute penalty back, after his Peugeot team gave them telemetry and other information from the vehicle that suggested there wasn’t a crash. “The telemetry does not show any crashes,” said Peugeot Sport boss Bruno Famin. “Maybe a brush, but nothing like an impact. The accelerometer didn’t register it, just as Carlos hadn’t. “It is clear that Carlos braked hard and turned the steering wheel sharply to avoid the quad. Famin also said he’s happy stewards looked at all of the evidence from Peugeot, since they “didn’t have all the data to make the decision” a few days ago.